[Spring quality] Include boric acid carbonic acid hot brine spring The 40 fountainhead is taking out the radioactivity in which 3 place has a strong enough to 30.8 ° (Kinsentou fountainhead) Masutomi, and temperature is also 30 degrees or more. Remaining 37 places are an average of 17 degrees. Seemingly, radioactivity will also be weak. Kinpo, the hot spring which seethes with the foot of a Mizugaki.The nature of Chichibu-Tama National Park which is in a designated place specially and a Hontani-river ravine and a primeval forest weave can enjoy itself through the four seasons.Especially red leaves are compared also with Oirase.a hot spring -- radium content -- there are many whom whoes by which it is known as the world's No.1, other components come out very abundant, and a hot-spring cure is periodically carried out for disease treatment, especially cancer recurrence prevention. National [ the 2001 May ] Arbor Day venue. They are 2230 m of Mt.Mizugakis to the right, 2598 m of Mt. Kimpu, and the left. Japanese One Hundred Famous Mountains, Back Chichibu Dominant Peak "Mt. 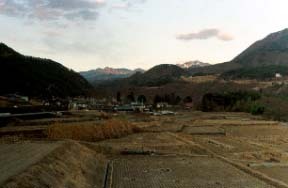 Kimpu"
A primeval forest and the mountain where a shakunage is beautiful.A Gojho-Rock huge in the top is an enough. The rocky mountain bristling with the eroded granite.The strange shape of a mountain overwhelms what is seen. The 40 fountainhead is taking out to Masutomi the radioactivity in which three places of an enough are strong, and, seemingly, temperature of radioactivity will also be [ remaining 37 places ] weak an average of 17 degrees 30 degrees or more. O It is a cross-over Kuromori course (winter is also a passing good and skid necessity) about Nagano-ken Kawaue-mura to the Shinshu Pass.